This entry was posted on April 11, 2016 by Texas Safety Supply. Best Cut Protection Gloves play a vital role in protecting hands and fingers of the industrial workers. The best Cut Protection gloves are essential for even the basic level industrial work. Hands are used in almost all the mechanical tasks. Even while handling the chemicals and industrial solutions, hands come into play. The more and more industries are using the technological methods to prevent the hazardous situations. The workers are an asset to the industry and their protection against industrial hazards should be taken seriously by the owners. Various industries have opted the methods to educate workers about safety gears. Cut Protection gloves are not the only gear that an industrial worker needs. However, if it comes to choose the very first gear, the gloves are recommended. It has been observed that hands have suffered the most in industrial injuries as compared to any other body part. Cut resistant gloves are constructed rigid to resist cuts, abrasions and force impacts. Let's discuss few things that you must know about the cut protection gloves. industrial standard rating makes sure that you are getting a quality product that performs and delivers the expected performance. The EN388 tag is used to describe the european standards while in american suburbs like mexico, south america, US, etc., the ANSI/ISEA standards are used to rate the cut protection impact gloves. These standards cannot be understood together but separately. According to ANSI/ISEA standards the performance level is defined on the basis of weight(in grams) that is required to cut through 1 inch of blade. The level goes from 0 to 5 and the quality and strength increases with the rating in ascending order. For example, not every industry requires a cut resistance performance level 5 gloves but those with high level of machines that runs on blades and sharp instruments require them. EN388 performance level is measured on the average cut index. The levels vary from 0 to 5 and the quality and resistance increases with the ascending order. It is understandable that even after the careful working conditions, injuries happen. The cut protection gloves are capable to provide the real time protection against the accidental abrasions and cuts. 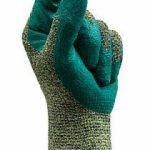 The materials soaks up the impact and protects your hand before your reflexes function. Comfort should be given an equal importance too when selecting cut protection gloves. It does not make any sense if your grip is not firm and shows confidence while working with heavy machines and sharp equipment. The fit should not be too tight or too loose, else the hand may not be able to hold the tools well or slip out of them. The industrial standard gloves are durable and provides enough life to carry on with the industrial job. The gloves demand a good maintenance and handling. The industrial owners should also conduct the quality checks of cut protection gloves at regular intervals of time. This helps in assigning new ones to replace the old.